The Sunday Telegraph is reporting that Steve Hilton, chief strategic adviser to David Cameron, is relocating to California where his wife - Rachel Whetstone - is taking up a six month appointment at Google's world HQ. It appears, however - despite The Sunday Telegraph's headlines - that Mr Hilton will remain a key adviser to David Cameron, on full pay but playing a strategic, rather than a hands-on role. It is a mark of Mr Cameron's respect for Mr Hilton that such a distant relationship has been accepted. So many decisions in politics come out of team discussions and a fast reaction to events. Mr Hilton's role will now have to be even more strategic - focusing on the big picture direction of the party. Alongside George Osborne and Andy Coulson, Mr Hilton is part of what Iain Martin has called The Quartet that runs the Conservative Party, with David Cameron. Although Mr Hilton is seen as a moderniser - and was behind the greener, gentler emphases of the period up until the course correction of last August, September - he also strongly supports the party leader's social conservatism and commitment to marriage, fatherhood and the family. Speaking to ConservativeHome last week Steve Hilton was full of the joys of fatherhood himself and his commitment to his own family explains this move to California. If the move is only six months - as billed - there are advantages to the Project Cameron. This is a time for Mr Hilton to observe the US presidential campaign at close quarters and be refreshed in his strategic insights. > More on the role each key Quartet adviser plays: Andy Coulson, Steve Hilton, George Osborne. In the May survey we asked for views on the futures of Boris and Ken (Clarke!). There has been talk of Boris as a future Tory leader and of Ken Clarke returning to a Conservative Cabinet. The box below summarises the views of 1,483 members. Yesterday, in our five-point tax and spend manifesto, we called on the Conservatives to abandon 'replacement taxes' - higher green taxes to pay for lower family taxation. There is simply no case for higher green taxes at the moment when motorists, hauliers and air travellers are facing rocketing costs. Noone would fault George Osborne if he got up and said that they're off the agenda for at least as long as oil prices remain so high. David Cameron hasn't been talking much about green issues recently and the FT has noticed, writing "when [the Conservative leader] set out the priorities for a Tory government this month, he made no mention of green issues." The shift in emphasis has also reached the Westminster insiders polled by PoliticsHome.com. Just 13% expect the Conservative party to be the party most focused on green issues at the next election. 73% think it'll be the LibDems. "The idea that green issues evaporate at the first touch of economic hardship betrays a misunderstanding of the environmental agenda. The necessity to build a sustainable economy is not just a “green issue”. It is just as much an economic one; business as usual is clearly unsustainable in the long term. Current economic stresses should underline that point rather than diminish it. Any public policy that makes our vehicles, homes and businesses more fuel-efficient and encourages the use of cheaper, more reliable sources of energy is not peripheral, but central. Green policies therefore become more important in times of economic stress, not less. The issues of increased energy costs and the need for emissions reductions must be addressed by policies to develop low-carbon technologies." We can sign up to the thrust of the argument but the price mechanism - rather than government intervention - should be the main driver of any conservation. The headline numbers point to a 24% Conservative lead. But the most interesting finding in the post post-Crewe poll - by YouGov for The Telegraph - is that voters have reached a clear conclusion that Brown is a massive liability to Labour. Although a slim majority - 52% - don't think a change of Labour leader will make much difference, 32% think Labour's chances will improve and just 8% think things will get worse. Only 15% are satisfied with Brown's performance and 75% are dissatisfied. There is much talk of the difficulty of getting rid of Brown. These sorts of polling numbers suggest to Labour MPs that Mr Brown's position is close to impossible. Could he really stay in post if Harriet Harman, Jack Straw, David Miliband and Alan Johnson call a meeting and tell him to quit? John Howard faced down such a delegation a year or so ago when the Australian Liberal Party was facing defeat under his leadership. He survived as Liberal leader but Labor's Kevin Rudd became PM in a massive win. PS Who are the 2% of voters who told YouGov that taxes are too low? Tonight's panel consists of Eric "the big man" Pickles, Global Vision's Ruth Lea, Geoff Hoon MP, Green MEP Caroline Lucas and military historian Dan Snow. The chatroom will be live at 10.30pm and will be moderated by a few nominated readers. "I have had a fair number of meetings with a number of people who want to meet privately. I can understand that. 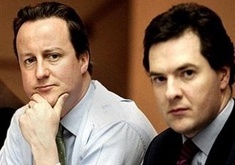 They are coming to terms with the fact there will be a Conservative government after the next general election. They do not believe their members would understand what they are doing." As Balfe wrote in an article for ConservativeHome at the time of his appointment, at least a third of union members are actually Conservative voters. Companies leaving Britain because of our nation's high and complex tax burden. Anger over the 10p tax increase produces the biggest crisis of Gordon Brown's leadership. Tax and the cost of living dominate the successful Tory campaign in Crewe and Nantwich. The front page of The Mirror and thirty Labour MPs demand a tax break for motorists. Labour MP Denis MacShane tells Telegraph readers that it's time to cut taxes and spending. Nick Clegg claims that only his party is committed to reduce taxation for lower and middle income workers. Professor John Curtice notes that support for higher taxes hasn't been this low for more than two decades. PoliticsHome.com's 5000 panel finds that tax overtakes law and order in voters' list of concerns. And, just today, The Independent's Associate Editor, Hamish McRae asks: "When times are tough, you spend less. Why should it be any different for a government?" How should the Conservative Party respond to this changed environment? The easy answer to that question is to stay doing exactly what the leadership has been doing. A large opinion poll lead would appear to vindicate the current strategy but David Cameron has rightly warned against complacency. Two years is a long time until the likeliest date for the General Election. We can't take victory for granted and we can't assume that Team Brown will keep shooting themselves in the feet. Most of all we need to think beyond politics and to the good of UK plc. One: Don't renew the pledge to match Labour's spending. Two: Promise we'll do for Britain what Boris is doing for London. Three: Embrace deeper welfare reform and Iain Duncan Smith's social justice agenda. Four: Promise to target tax cuts on the lowest income Britons. Five: Abandon all schemes for 'replacement taxes'. 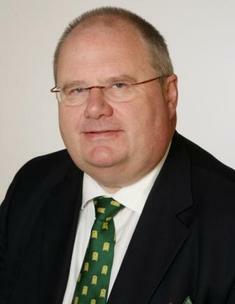 The Conservative Party has a new star - or, more accurately, grassroots members have recognised that Eric Pickles is a star. David Cameron calls him the "big man" and he played leading roles in the victories of 1st May and at Crewe and Nantwich. Two months ago when Conservative members last ranked the shadow cabinet, the Shadow Secretary of State for Communities and Local Government ranked 10th but he's now shot up to 3rd - just behind the members' favourites; David Davis and William Hague. Most of the shadow cabinet see their ratings rise compared with two months ago (ratings represent the percentage of Conservative members satisfied minus those dissatisfied). In addition to Eric there are big increases for Andrew Lansley, Oliver Letwin, Theresa May and Francis Maude. Francis Maude's increase is particularly striking. He has largely been in negative territory throughout these surveys but has a +15% rating this time. This may reflect strong recent media performances and a recognition of the importance of his 'preparing-for-government' role. Sayeeda Warsi loses some ground after successive months of moving up the league table. More interesting is the continued weakness of Andrew Mitchell and Theresa Villiers. Even in these good times for the party - and with their portfolios in the news - their ratings are down. This morning's Telegraph reports that the EU Parliament is attempting to make significant changes to the rules governing the formation of groups that are eligible for funding. Each group will need to have 30 MEP members, rather than 20, and have members from a quarter of EU states, rather than a fifth. The Telegraph sees the move as an attempt to thwart Euroscepticism within the Parliament and protect the status of the EPP and Socialist groupings. That may be true but the immediate consequence would be to make it much, much harder for Conservatives to form a group outside of the EPP, as David Cameron has repeatedly promised to deliver. "The real aim of the game is to sabotage the Conservative Party's attempt to break away from the EPP group – a central part of David Cameron's strategy to parade his "Eurosceptic" credentials. Already, the Tories have had such difficulty in meeting the existing requirements to form a separate group that they have not yet been able to make the break. Lifting the barrier will make it near impossible for them to do so – which is precisely the intention. Without formal recognition as part of a group, the Tory splinter would have to sit as "non attached" MEPs, alongside communists, fascists and other odds and sods – a constant source of embarrassment and ridicule. Also, they would lose out on much coveted chances to become committee chairman as well as membership of delegations and the jollies that go with it." 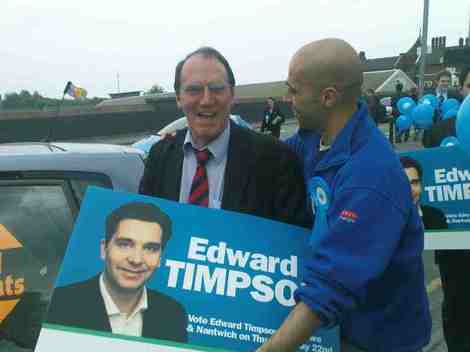 Mr North also suggests that Timothy Kirkhope MEP is one of the drivers behind the move. This we cannot substantiate but Mr Kirkhope certainly dragged his feet as leader in fulfilling the London party's wishes before he was removed as Delegation Chairman last year. Is this the thanks David Cameron gets for ensuring that all incumbent MEPs remain on the top of the lists for next year's European Elections? Mr Cameron and William Hague must move quickly to ensure Conservative MEPs are no part of these rule changes. Failure to act will suggest that the Tory leadership is resigned to not delivering on its EPP promise. Related link: Dan Hannan sets out Seven Reasons Why We Should Leave The EPP. "At the meeting of the European Parliament Constitutional Affairs Committee [on Tuesday], Conservative Spokesmen Timothy Kirkhope MEP and Vice Chairman of the Committee was a leading opponent of Richard Corbett's proposals to raise the minimum threshold for the establishment of political groups in the European Parliament and indeed, these proposals were indeed defeated in that committee, by one vote. At the same time, Mr Kirkhope was able to secure additional amendments that could mean that smaller groups should not automatically be dissolved, were they to fall below a minimum threshold, as is currently the case. The result of these votes means that either the proposals will have to be withdrawn altogether or they will come before the plenary session of the Parliament next month with little remaining credibility and of course Mr Kirkhope will be advising all Conservative MEPs to continue their opposition to any changes that would raise the threshold for the establishment of new political groups." 2.45pm, 29th May: Dan Hannan has now blogged on this topic. ConservativeHome.com's May survey is now live. In addition to the regular tracker questions about the performance of David Cameron and the shadow cabinet we are asking questions about Boris Johnson, Ken Clarke, MEP selection and a few questions about ConservativeHome itself. It's not just the general public that is becoming less concerned with green issues. The Guardian's Jon Harris told Adam Boulton yesterday that even the chattering classes assembled at the Hay arts festival have stopped chattering about climate change. Mr Harris was even paying tribute to budget airlines. It's amazing how an economic turndown changes priorities. Some aren't giving up, however. The main news on this morning's Today programme was a report by a committee of MPs - chaired by Tim Yeo - that individual carbon accounts should be introduced for every single UK citizen. "The initial response to the idea has concentrated on the enormous amount of computing and form filling there would need to be to capture everyone’s travel, heating, lighting and other uses of energy. It would make the ID computer look modest, cheap and not so intrusive. Government inspectors would need to watch over everyone’s habits and try to find a way of recording just about everything we do." Complexity would only get worse if governments, for equity reasons, chose to adjust people's carbon limits for their age (older people spend more on heating), location (rural people spend more on transport) and health (very disabled people spend more time at home). Fortunately the Conservative Party is almost certain to reject Mr Yeo's ideas. On all the big green issues - green taxation, nuclear power and airport expansion - the party's initial green fervour is fortunately giving way to a more traditional approach. ConservativeHome placed an environment design in our pre-Cameron masthead of shields because we believe in the importance of protecting the environment but it should be a sensible, practical environmentalism of the kind practised by local Conservative councils: recycling, protection of natural habitats, planting of trees, action against litter, better home insulation, pedestrian-friendly transport policies in town centres. We don't deny that global warming may be real but sign up to the Copenhagen Consensus' analysis that there are more urgent things that can be done to improve human welfare than spend billions on green policies. Meeting again this month to take another look at global warming and other great issues, the CC has previously put action against malaria and support for free trade as better priorities for today's public policymakers. "No one should be penalised for trying to do the right thing"
A few weeks ago we asked readers to suggest one memorable sentence that should sum up what Conservatism stands for under David Cameron's leadership. Janet Daley has provided a very good answer in today's Daily Telegraph: "No one should be penalised for trying to do the right thing." "Parents who are determined to get the best possible education for their children should not be treated like criminals. People who work for a living and provide for their own families should not be worse off than people who don't. Couples who stay together while raising their children should not be made poorer than those who do not. The needs of the law-abiding should always come before those of the criminal." The elimination of the couples penalty that currently means that there is an incentive for very low income parents to live apart or to be dishonest - paid for by welfare reform. Requiring unemployed people to undertake community work after they've rejected reasonable job offers. The ending of the double taxation embodied in inheritance tax - paid for by a tax on non-doms. Boris' hope to agree a no strike deal with the transport unions in return for honouring independently arbitrated pay deals. A review of how we treat our soldiers by a commitment to renew the Military Covenant. Across the board - including with regard to the Scotland-England relationship - there is enormous potential in this political theme. It can be summed up in one word, a word that is essential to Britain's understanding of itself: Fairness. After years of Labour failure, people are crying out for it. As we've blogged before, the standard ConservativeHome talk to Conservative Associations over the last six months has been divided into two halves. We begin with the good news and it's all political. The rise of the Conservatives and the decline of Labour. Bottler Brown's 'Ratner Saturday' was, we argue, the decisive turning point in Labour's political fortunes - and our own. We then turn to the bad news: the weakness of Britain. Britain's problems are different from 1979 but at least as challenging. An economy built on debt. A tax burden that is putting UK plc at a terrible economic disadvantage. Schools that don't teach the basics. Hospitals that don't stand up well to international comparisons. A growth in extreme poverty. A policing culture that is cowardly in the face of militant Islam and anti-social behaviour. A culture that worships irresponsible behaviour and is indifferent to the importance of parenting and the family. An overstretched, underfunded armed forces. A constant bleeding of powers to the EU, a United Kingdom in danger from separatists and an unprecendented distrust of politicians. In yesterday's Daily Mail Max Hastings provided his own catalogue of Britain's problems. It's a must-read piece. He says that David Cameron will need to "play hardball" as Prime Minister. Max Hastings is right. In terms of meeting the big challenges we can take a lot of encouragement from Boris Johnson's first moves. On Thursday the new Mayor of London announced that Tim Parker had been hired as day-to-day chief of City Hall. Mr Parker has a great record of cost-cutting in both the private and public sectors. Unsurprisingly, the left doesn't like this inspired appointment. A record that he'll now bring to London after years in which Ken Livingstone allowed costs and council tax to get out of control. Boris has also brought one of the two men behind Carphone Warehouse's success into an executive role for the Olympics. Hammersmith & Fulham's tax-cutting leader, Cllr Stephen Greenhalgh, is helping with an audit of City Hall. Ray Lewis, a very successful social entrepreneur, is advising Boris on London's problems of youth crime. David Cameron has two years to prepare for 'hardball'. Personnel picks are going to be almost as important as policy decisions. The same individual helping Boris with his appointments - Nick Boles - is also right-hand man to Francis Maude; the shadow cabinet minister responsible for David Cameron's transition plans. The Scottish party - backed by Conservatives in London - has decided against an early referendum as favoured by former Scottish Secretary Lord Forsyth and Scottish Labour leader, Wendy Alexander. One of the reasons Lord Forsyth favours an early referendum is that he doesn't want Alex Salmond, SNP First Minister, to be in charge of timing. Alex Salmond hopes to turn his planned 2010 referendum into a verdict on what may be a new Conservative government in London - supported only by a handful of Scottish Tory MPs. "The SNP leader says his administration, as well as civic Scotland, will resist Cameron's plans to cut welfare benefits, replace Trident and slash the country's funding settlement - and oppose any attempt by future Tory ministers to set fisheries and marine policy." Eddie Barnes of Scotland on Sunday also imagines how Alex Salmond will react to the election of a Conservative government and reaches similar conclusions. 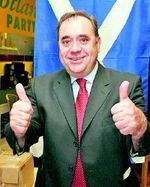 Salmond, he writes, will ask the Scottish people to vote for independence on the basis that he rather than David Cameron should take the big decisions for Scotland. Speaking to Scottish Conservatives in Ayr, on Friday, David Cameron said that as Prime Minister he would not frustrate SNP initiatives in Holyrood but he would never risk the Union. Although he said that a review of the Barnett formula for the distribution of public funds across the UK was "essential" he would not support a reform that endangered English-Scottish relations. Funds raised in the north stay in the north. There are Shadow City Ministers in Sheffield, Leeds, Hull, Liverpool, Manchester, Tyneside, Wearside and Teesside. There has been a doubling of the professional staff in the North and the opening of new fully equipped campaign centres in Bradford, Salford and Newcastle. The Bradford Campaign Centre opened by Party Chairman, Caroline Spelman in September 2007, is the most modern and best equipped political campaigning facility outside of London. More visits to the north by David Cameron than any Conservative leader in modern times. "I am delighted that Michael Bates will be joining the House of Lords. He will be an excellent member. He has a long record of public and political service. Most recently, he has worked hard to help re-establish the Conservative Party in the North of England. He will continue with that task in the months ahead. I look forward to working with him in Parliament." "This is great news for the North of England and the Conservative Party, to both of which Michael Bates has already given outstanding service. He will be a strong voice in the House of Lords." * Michael Bates' real title is yet to be announced! Have you ever claimed less than the full entitlement, or repaid any excess? Do you employ any family members? They seem perfectly reasonable questions to us but only 19 of Britain's 79 MEPs were willing to provide full answers. Another 14 gave partial answers. Click here for a full breakdown. Some Conservative MEPs answered in full: Richard Ashworth, Nirj Deva, Jonathan Evans, Dan Hannan, Chris Heaton-Harris, Syed Kamall, Sajjad Karim, Neil Parish, Charles Tannock, and Geoffrey van Orden. "If you value your relationship with the Conservative Party I would recommend that you think very carefully about continuing with this... I regard the whole exercise as completely unnecessary." Such arrogance stems, in part, from MEPs' almost untouchable status. The opaque selection process used by the Conservative Party meant that all incumbent MEPs were put straight back at the top of regional lists. The combination of a gerrymandered selection process and proportional representation means that it's almost impossible for ordinary voters to hold MEPs to account. Now that the recent run of elections is over ConservativeHome is resuming our campaign on the MEP selection process. We hope to have something to say in the next few days. "Bloody great campaign big man! You never let me down"
Stephen Gilbert was in Crewe and Nantwich from the morning of 2nd May and his early leaflets were decisive in framing the contest as a straight two-horse race between blue and red. 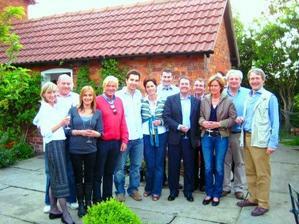 He took the whole of Lord Ashcroft's marginal seats team up to C&N with him. There was no need to build a special team - the team already knew each other and gelled. David Mackintosh secured the geographically strategic premises and made everything happen on time. Stephen Gilbert's other key aides, Stephen Phillips and Stephen Parkinson also deserve a free drink when you bump into them next. Make that a few free drinks. Alan Sendorek ably handled the media throughout the campaign. He was assisted in the final week by George Eustice, who had been drafting literature throughout the campaign and coordinating the softer, feature-style journalism. Nick Timothy of the Research Department helped to identify the messages on 10p, cost of living and crime that the party's excellent literature then communicated. (1) and (2) William Hague and George Osborne - two northern MPs who were constantly on the campaign trail. (3) Angela Browning, the candidate's minder. (4) Michael Fabricant, who coordinated the massive involvement of MPs in the whole effort. Michael Fabricant was most assisted by a 'Magnificent Seven' MPs who worked alongside professional agents in each of the seven 'battle sectors'. They're all pictured on the right (with Liam Fox whose brilliant BBC performance has been praised by Iain Dale): Stephen O'Brien, Graham Brady, Philip Dunne, Robert Goodwill, Ben Wallace, Daniel Kawcyzinski and shadow cabinet minister Owen Paterson. And a final tribute to local Chairman Donald Potter. Sometimes in by elections you end up with tensions between the local association and the central campaign team - and it is testament to his skills that the staff and local association worked together seamlessly. He was calm, constructive, added local knowledge to all that the campaign team did. Chairman of the Association for eighteen lean years he made sure that canvassing was never neglected and that gave the campaign a tremendous head start. He has a special reason to savour victory. Who have we forgotten? The party's unsung agents. The hundreds of volunteers who gave up holiday, sleep and overtime. Great work everyone. The men in top hats are gone! Labour threw everything at Edward Timpson but they failed. Labour fought the most xenophobic, class war-rooted, backward-looking, negative, divisive campaign and it failed. They showed that they were no longer the party of aspiration. New Labour died on the streets of Crewe and Nantwich. Voters didn't stay at home, didn't vote Labour, didn't vote LibDem - they voted Conservative. But we will not give one hint of triumphalism or complacency. A by-election isn't a General Election. People have given us trust and we now need to earn it. We must build the biggest coalition of change; something different, something bigger. We must end the era of top-down, bossy, high-taxing and wasting government. 11.55pm: Great quote from Andrew Sparrow at The Guardian: "Pickles should look cheerful, but he doesn't. "I've been up since 4 o'clock," he explains when I ask why. "For politicians, elections are like a combination of Christmas Day and root canal surgery."" 11.42pm: Reminder to read Jonathan Isaby's twittering from the count. Lots of good observations from him. 11.30pm: WE ARE CONFIDENT THAT CREWE & NANTWICH IS A TORY GAIN. WE EXPECT A 'SUBSTANTIAL' TORY MAJORITY. PERMISSION GRANTED TO CRACK OPEN THE CHAMPAGNE. 10.40pm: Graeme Archer has just posted on CentreRight about Tamsin Dunwoody standing as the Labour candidate when she could/ should have been grieving. 9pm: For context this graph (from The Telegraph's by-election HQ site) is useful. Three Line Whip's Jonathan Isaby will be 'twittering' from the count from 10pm. 7.50pm: O/T but have you seen this? : "The European Parliament and the European Commission have bought the former Tory headquarters near the Houses of Parliament for £20m." 7.30pm: Nigel Fletcher captured this photo of a Tory activist with LibDem MP Simon Hughes. Is this the new stage of lovebombing? Welcome to our rolling coverage of the countdown to the result of the Crewe by-election. We'll be setting up a live chatroom later but will be blogging regularly within this post for the next few hours. Sam Coates of The Times (not THE Sam Coates), has already recorded one dirty Labour trick of the day. We've just heard of another. 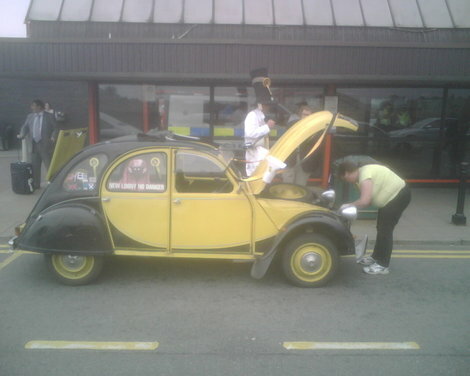 Some Labour activist, wearing a Panama hat, has been swanning around Crewe all day in an open top car trailing blue balloons. Pathetic. Plus two photos from earlier today: Top is a photo of four MPs - Alistair Burt, Mart Francois, Stewart Jackson and Daniel Kawczynski. 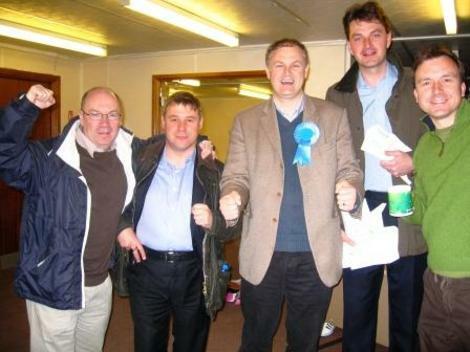 The fifth guy is Andrew Griffiths; Eric Pickles' chief of staff and, we hope, the next MP for Burton. Below that is the number of poster sites that have been actioned by the campaign. 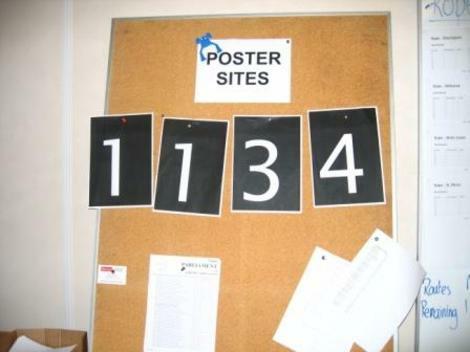 1,134 is a record by some margin. Also: Don't miss our earlier reports on the gingerbread men poll and news of the 4am GOTV effort. A campaign to encourage public sector institutions to buy local produce for the sake of Scotland's economy and the wider environment. The introduction of Bills that would produce a National Register of Tartans and another, from Murdo Fraser, that would protect rural schools. David Cameron will address the Ayr gathering tomorrow. David Cameron has a positive approval rating of +19% in Scotland compared to Gordon Brown's negative rating of -41%. This 'Cameron effect' has yet to boost the Scottish party's overall standing, however. Scottish Tories are at the same opinion poll rating as last May. We're told that the party's opinion poll standing has improved! The source for this is the SNP! A study of four UK-wide opinion polls from May suggests Tory support in Scotland is now 21% cf 16% in 2005. That could produce six extra Tory Westminster seats. Alan Cochrane reviews the Scottish party's performance in The Telegraph. He pays tribute to four MSPs, in particular: Derek Brownlee, Liz Smith, Ted Brocklebank and Alex Johnstone. But he calls for Annabel Goldie to spend less time dealing with the Nationalists and more time battling them. Former Scottish Secretary Lord Forsyth recently expressed support for an early referendum. He believes that the Unionist parties shouldn't be following Alex Salmond's timetable that would see Scotland vote on the Union in 2010. He - unlike the Scottish Party and Sir Malcolm Rifikind - wants a vote next year. PS We'd like to compile lists of the best Scottish and Welsh Tory blogs. Please email us if you can help. "I am sure when your Private Secretary reminded you of today’s event you felt like reaching for the nearest stab proof vest - and perhaps slipping into old habits and lighting up to calm your nerves... But as you have reassured us, you have moved on from these past indiscretions... Your recent crimes have been more for the serious fraud office than the drug squad!" "You will say that you could not take any risks with inflation by conceding on police pay. But let me ask you this. How was it that the government found 2.7 billion pounds to dig itself out of a tax hole in advance of a by-election but couldn’t find 30 million pounds to honour our pay deal?" "When teachers went on strike, the Prime Minister and the Education Secretary’s response was to say that it would be ‘irresponsible’ to over-ride the settlement recommended by their independent pay review panel. So it suited Mr Balls to defend the teachers’ panel deal but it didn’t suit you to do the same for us. Home Secretary, what is it that Mr Balls has but you do not..."
"Your decision not to honour the pay award was a breach of faith. It was a monumental mistake and I do not say this lightly when I say you betrayed the police service." Here is a PDF of the full speech. 12.30pm: Gordon Brown ends by warning that he will be examining the performance of Conservative councils over coming months - particularly how they help the elderly. 12.27pm: Brooks Newmark MP asks for the PM's view on the fact that domestic violence incidents has trebled to over 600,000 incidents each year. [What a shocking statistic]. 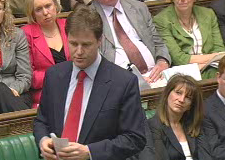 12.15pm: Nick Clegg asks about Afghanistan following his recent visit there. It might take thirty years, he says, to rebuild the nation and does more need to be done to persuade the British people of the need for a long-term commitment? 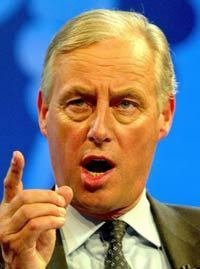 He calls for the UK Defence Budget to be strategically reviewed. 12.12pm: Cameron responds by quoting Tony Blair who said that he didn't understand the tradition that PMs didn't attend by-elections. Brown says that David Cameron never asks substantial questions. 12.11pm: Cameron: Why hasn't the PM had the courage to go to Crewe and Nantwich to explain his views on 10p? Brown replies by saying that it's not usual for a PM to go to a by-election.